We headed over to Featherston today despite the 100k odd gale warnings and it was quite an interesting trip! Martinborough is down in a basin lower that Featherston so I suspect that protects it against the big blows but once up on the Featherston plain despite heading strait into the wind, it was evil. The Van was all over the place. Slowing down to 65k odd helped but that was all we could do when were exposed in the sides. 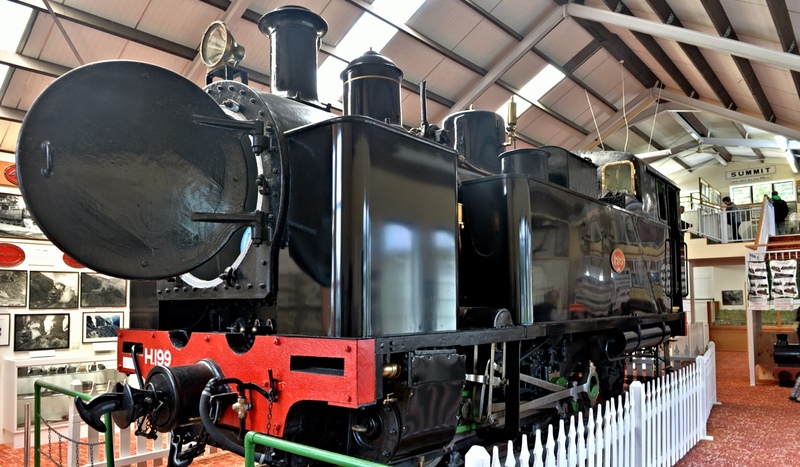 We looked for a park so the van wasn’t side on and found the Fell Locomotive Museum right over the road. You could barely stand up in the wind so we thought we’d run for cover into the Museum. What an interesting place. The steep grades over the Rimutakas ranges were such that they had specially designed Shunters that used a third rail to climb and brake. 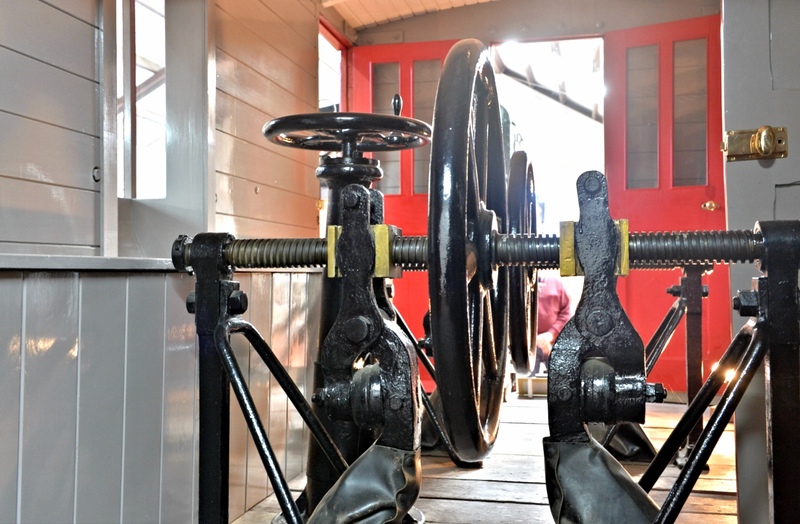 A display showing how the centre rail, the one on the left was for the loco to grip onto for traction and braking. The normal rail on the right. 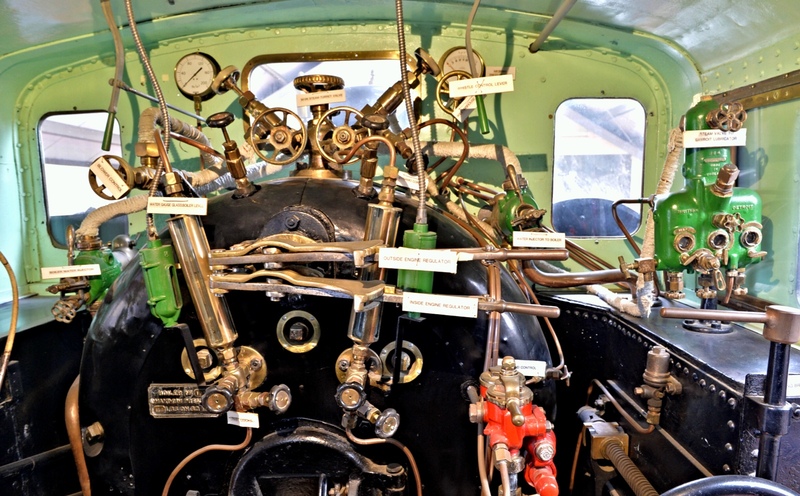 Apparently, they used to get through a set of 8 brake shoes per loco for each descent and 4 for each brake van each descent! They had a cog driven wheel in each side of the loco of the centre rail that was wound in by the engineer and driven by the steam engine. It was held in by gigantic springs for the extra traction uphill. Apparently it worked really well. Each loco could deal with 3 passenger wagons or 4 freight vans depending on the weight and it was quite common to see 4-5 Shunters per train with passenger carriages and freight in between. The brake van. The guard used to wind the brakes in on springs so the pads would slow on the centre raised rail. Under the loco showing the brakes on the raised rail. There were two huge geared wheels which locked in behind the brakes for uphill traction. We were warmly welcomed by some nice chaps who showed us and explained us how it all worked and then shown to a theatre where we saw an early 1900’s film of the whole system working. Great film. Funny to see all the old clobber that people wore back then and really interesting. 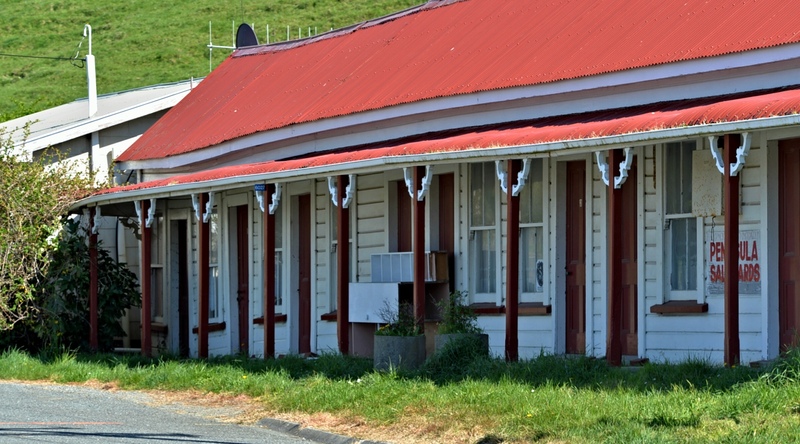 If you’re in Featherston, check it out. At $5 a head it’s well worth the visit. 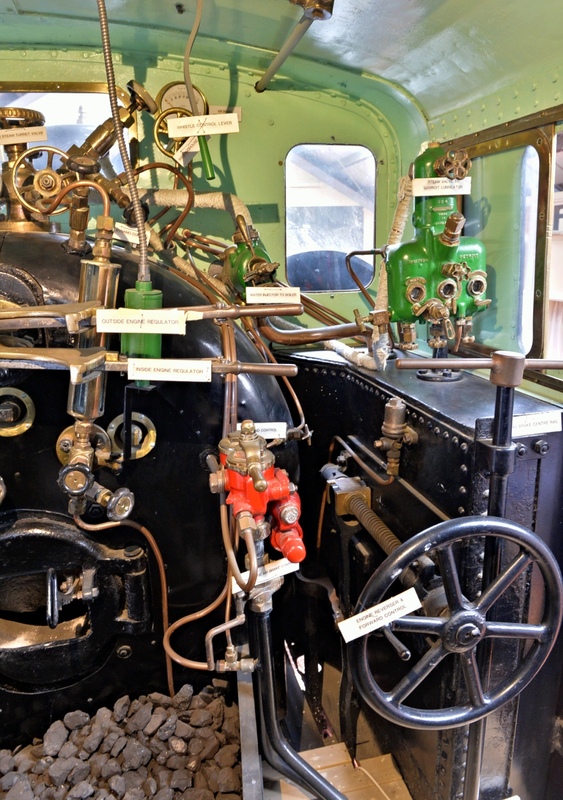 Another pic of the skippers cabin showing the firebox and other controls. We visited an unnamed disappointing coffee shop after that, that interestly had its front door facing out of the wind ! Awful coffee and very average cakes.. That’s the first we’ve struck that bad on the whole trip so can’t really complain. 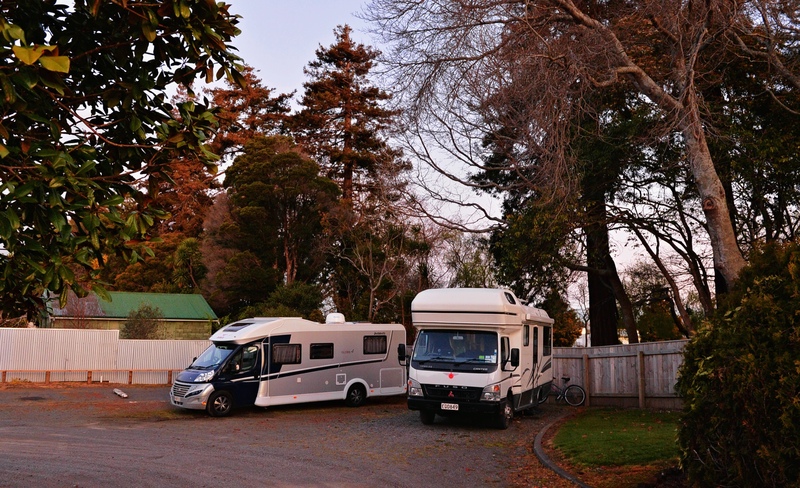 Given the wind was so bad, we headed back to Martinborough for our last night. Rugby tomorrow morning. All Blacks v France. Just as well I brought the sky card with us. We’ll head to Napier after that. 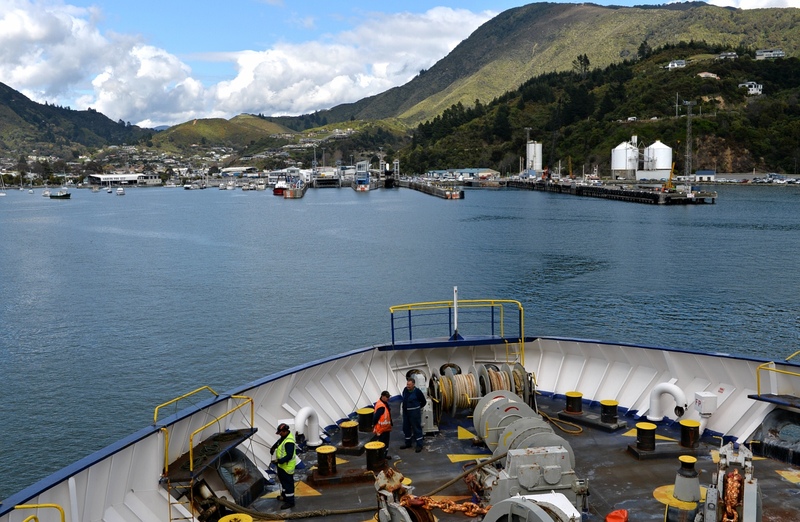 We left Rarangi about 10 on Wednesday and cruised up to Picton to catch the 2pm ferry to Wellington. The weather again was kind for a good crossing and by 5:45, we were cruising up Wellingtons main motorway heading for Fiona’s cousins in Raumati to join them for tea. 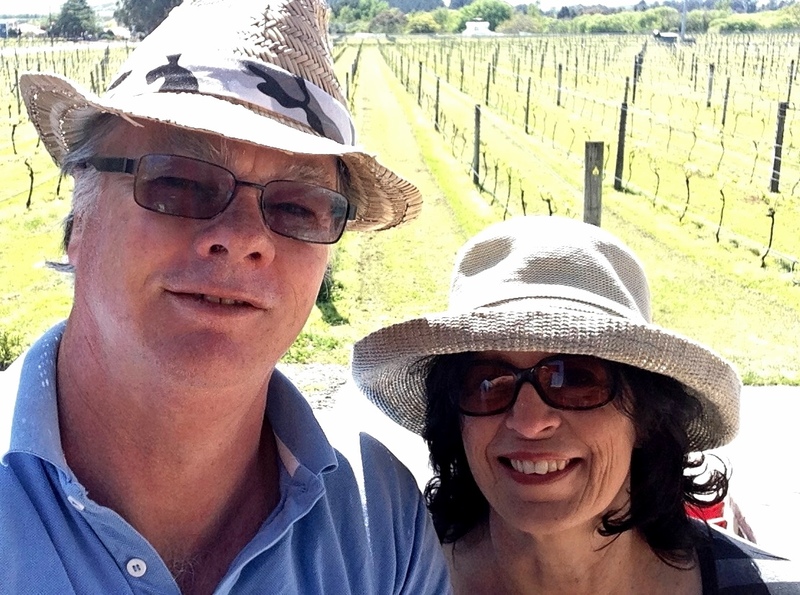 After a great fun night with them, the next morning we left to head to the wine area around Greytown and Martinborough . 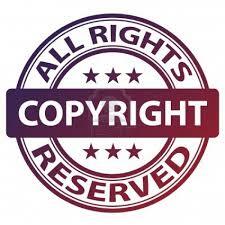 Remember clicking on the images will display them at hi resolution. 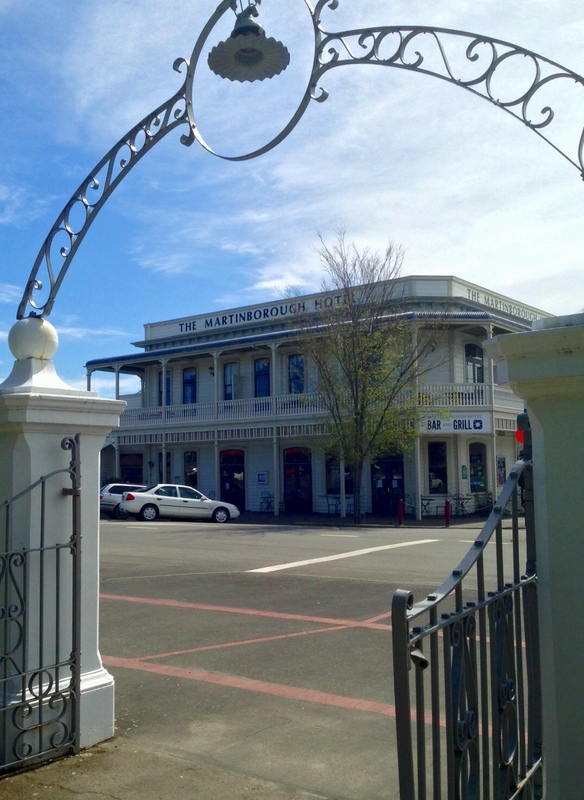 We spent the afternoon checking out the Greytown shops which must be one of the oldest done up towns around. They’ve spent a lot if time and effort on doing old things up rather than knock them over and it looks great. 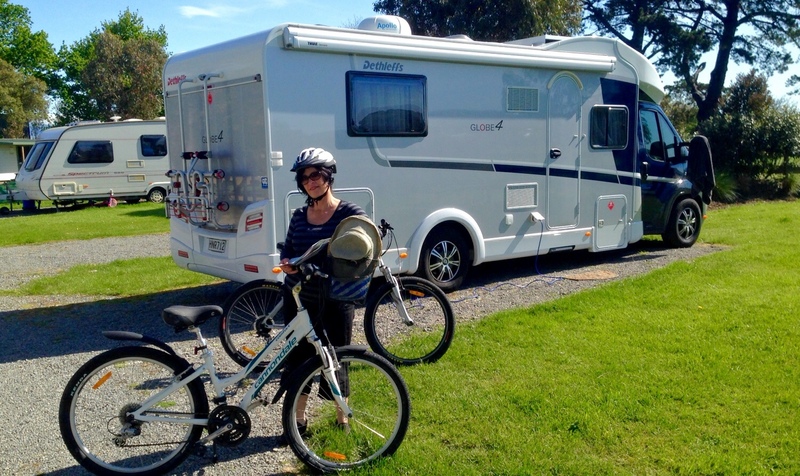 Later in the day we cruised over to Martinborough and checked into the Motorcamp. The next day after breakfast and getting the bikes off the rack, we were off to check out the vineyards and Olive Oil. 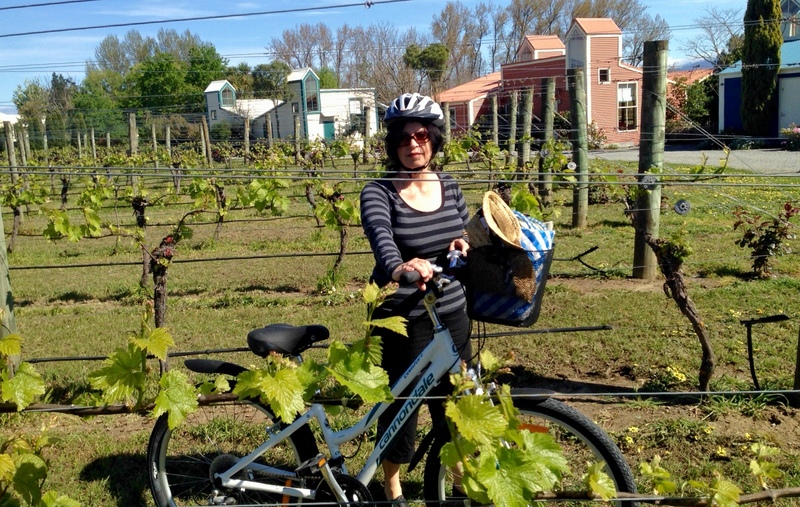 Martinborough is perfect for bikes as it is dead flat. Our only impediment was a stiff westerly wind but nothing our 10 speeders couldn’t deal with. We found a boutique vineyard not too far from town called Margrains. After a great lunch in the sun, we checked out the cellar and due to people being on holiday, the owner was working the cellar. He was very knowledgable and a real character and was passionate about his business. The Pinot Rose, Chardonnay, Pinot Gris were all amazing wines all with less sugar. The Pinot Gris was much drier as a result and was a superb and very drinkable wine:-) I ended up buying a mixed dozen of different wines which we’ll collect tomorrow with the van. A lot of fun and he wasn’t going to let me go until I’d tasted all 9 of his great wines. I was well and truly ready for a bike ride ! We headed from there about 4ks towards an Olive place so Fiona could grab and taste some Olive oil. So after 20 minutes or so of riding out if town, we came across our Olive place with a closed sign.. Bugger! We rode back into town for a cup of tea, a visit to the 4 square shop and then made our way back to the van. A good day, nice weather and I’m looking forward to trying one if those wines over the next few days. We were up early in Christchurch to get under way to Rarangi. The Gps suggested the trip was 330 odd k’s and about 3.5 hrs driving. A quick visit to the dump station to empty tanks and fill up the potable water and we were away. 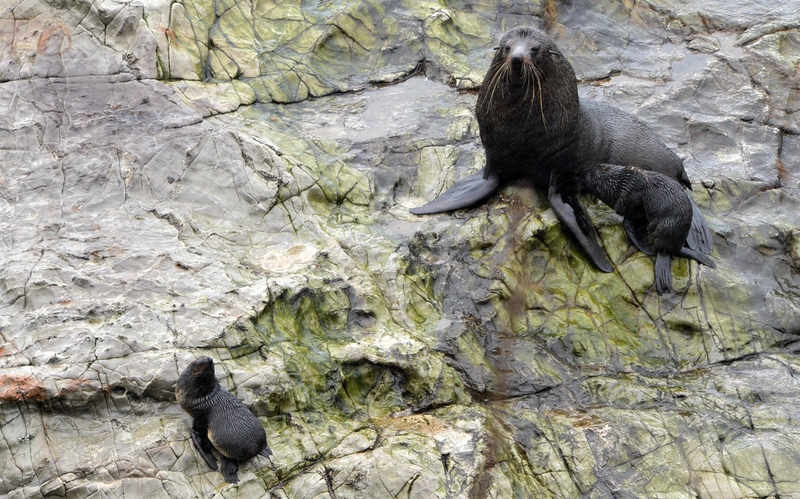 The forecast suggested it would be wet by the time we reached kaikoura, the home of crayfish and whale watching. With light traffic and long straight roads, we were in Cheviot by 10:30! There is a Gallery and Cafe on the left as you come into Cheviot from the south that makes the best Chicken Filo with amazing pastry. If you’re in the area, try it, you won’t be disappointed. The coffee is great too. 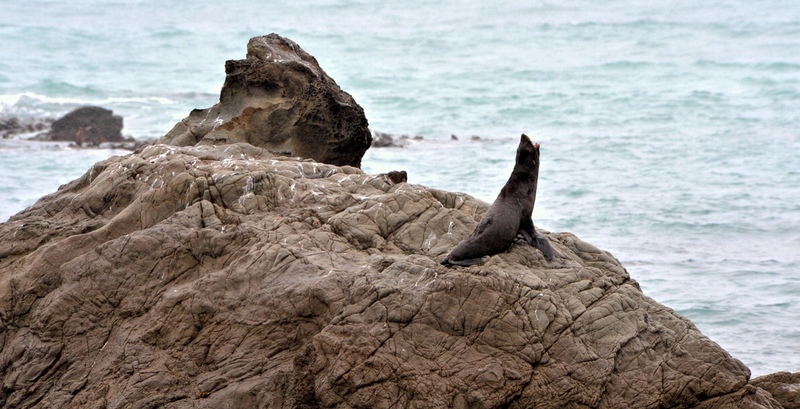 After 30 minutes or so, we were on our way to Kaikoura. By the time we arrived, the weather was threatening to rain but almost everything was shut. I overheard one tourist after rattling a door to a closed cafe “what time to they get out of bed here?” Had to laugh but understood where he was coming from. 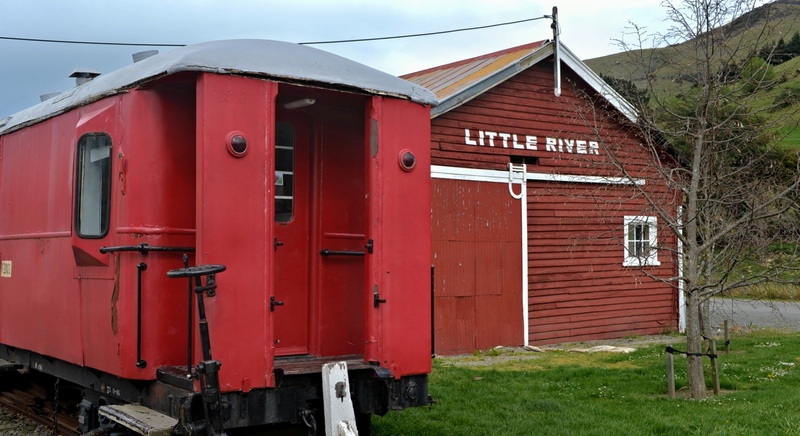 Before we got to Cheviot, we’d stopped at both Greta Valley cafe and Dommett railway cafe to find them both closed with several vans and people wanting some service in the car parks. Fiona went to the supermarket at Kaikoura which was open, and got some tatare sauce knowing we were looking for some crayfish. 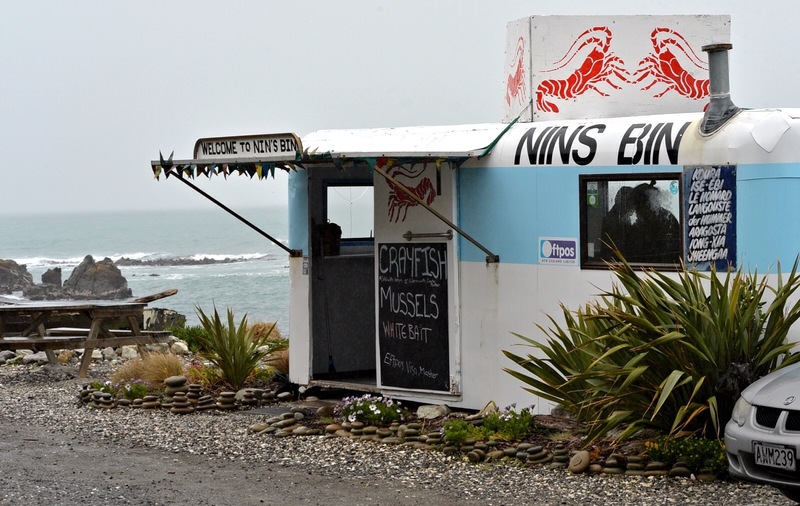 The lady in the supermarket told her about Nins bins which was a caravan on the side of the road 20 k’s north of Kaikoura. By the time we got there it was pouring with rain but Fiona was in a sprint to get through the door to get her cray. The lady in the caravan was great. 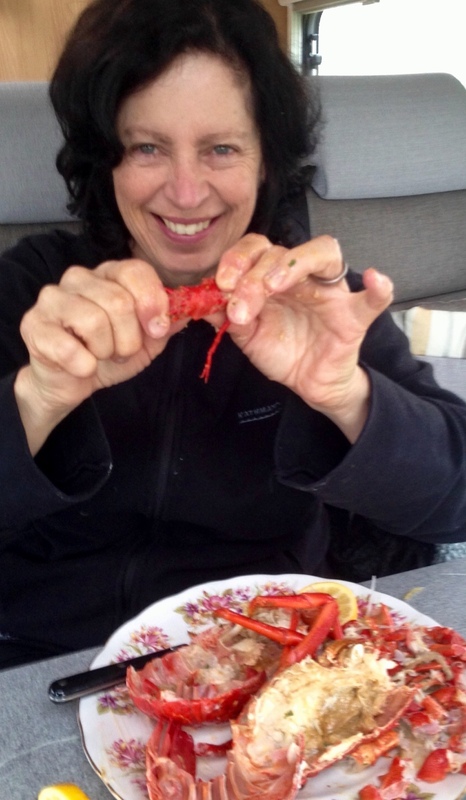 Fiona chose a cray, she cut it in half in the bench and tossed it into a frypan with Garlic Butter. It was delicious. 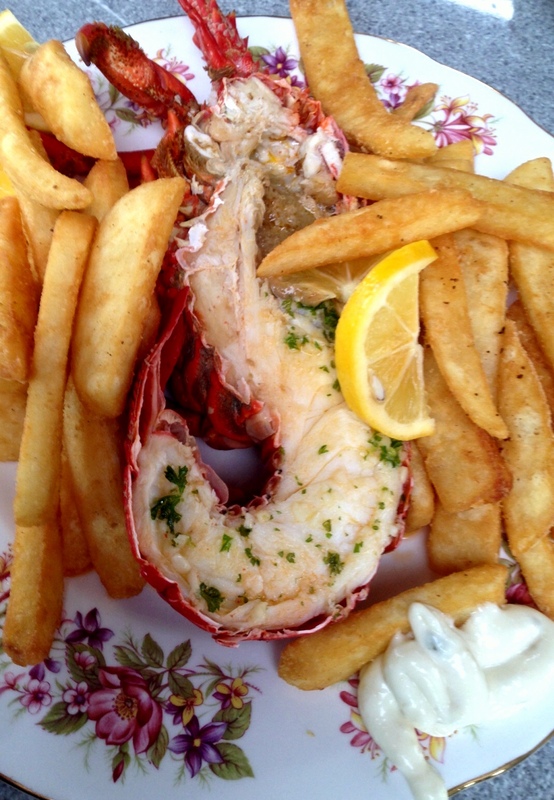 We paired it off with some lemon, some beer battered chips and heaps of tartare sauce YUM! She even put it on our plates from Rafe so we could sprint back to Rafe through the rain and enjoy lunch. 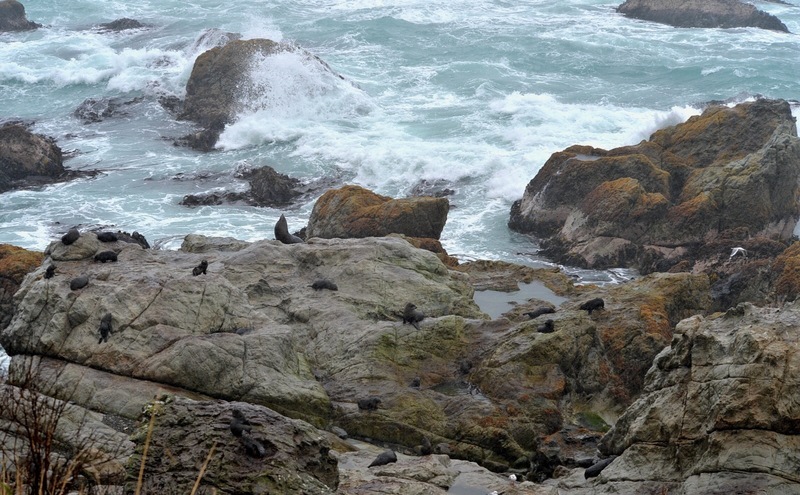 After a cup of tea to wash it down we were under way to see the seal colony about 3-4 k’s away. The rain was a pain for my camera but we saw enough and got a few piccies so we were on our way to Blenheim. We were making a return visit to a chocolate factory we visited on the way down and after this a craft centre which we drive past earlier that I promised we’d go back to. There was also wine tasting as well so while Fiona was doing the crafts, I checked out some nice Chardys and Pinots! 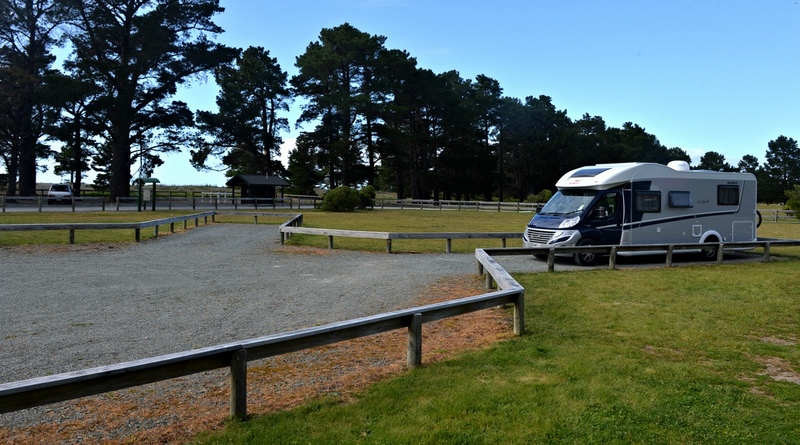 10 k’s away was our overnight stop at Rarangi, a DOC park on the water. After settling in, we went for a walk up to the point and to Monkey Bay where there are caves have completely undermined the cliff with the water. 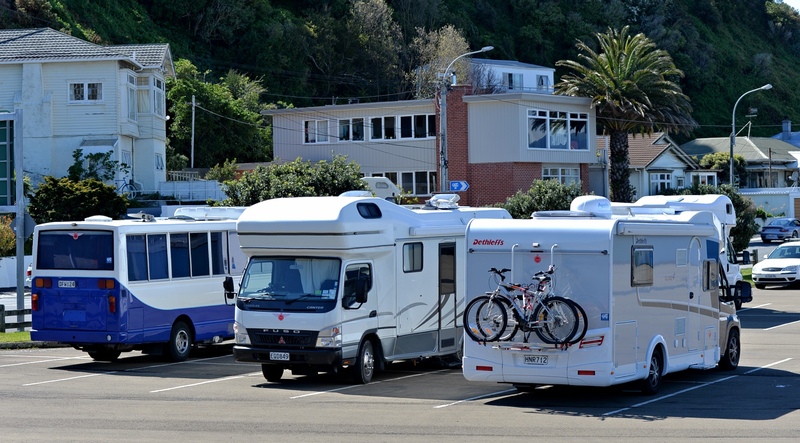 Tomorrow, we’re off to Picton to catch the ferry to Wellington to start our trip north. The view out of the front window at our site in Akaroa. We woke up to the alarm at 4:30am to watch the France v Ireland Rwc game, Ireland won! Great game too. After falling asleep, we woke again at 9am to see another great day of sunshine. The forecast was awful with north west gales and rain on the way so we thought we’d head from our North West facing perch for somewhere a bit more sheltered. 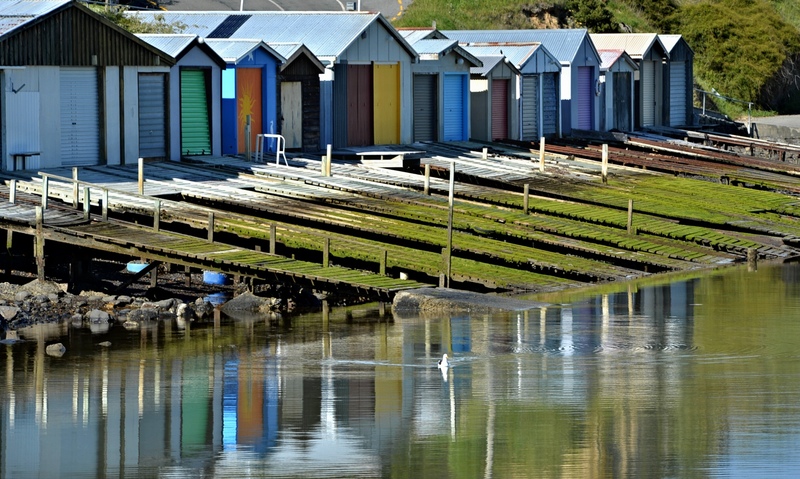 We decided to head to Christchurch and leave our wonderful view over Akaroa, and catch up with some relatives. On the way, we went through Duvachelle harbour where there is an amazing rows of boatsheds. 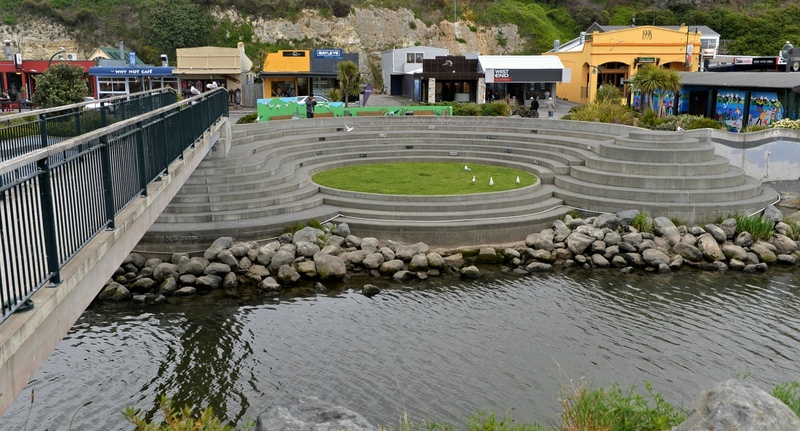 I thought maybe they have to paint them these colours for resource consent reasons but surely not! There is a huge Motorcamp right on the water there which looks quite good. Moving on from there was the Duvachelle Hotel, which has a for sale sign if anyone us keen. Over the road is an amazing row of colonial cabins? .. Or rooms, I’m not sure what but an interesting building. A kilometre or so down the road we were at the Barry’s Bay cheese factory where we bought some beautiful cheese and of course a bottle of Chardonnay to go with it. The cheese is made on site and there is a huge window from the retail are which looks through so you can see the cheese actually being made. We stopped over the hill at Little River for lunch. 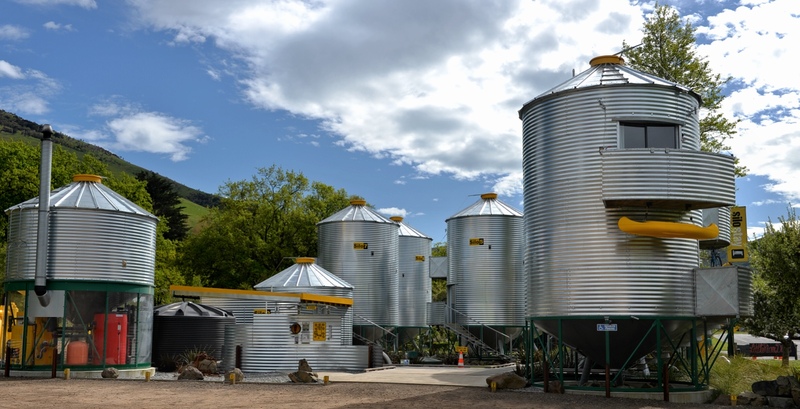 Interesting little place full of history and with some corrugated iron silos, turned into holiday accomodation. We stopped along the way to get a piccie of Lake Ellesmere. I kicked myself a bit here as on the way to Akaroa, it was sparkly blue sky and water with a cyclist riding through. It would have made a much nicer piccie.. Oh well! After a trip to Burnsco and Papanui Countdown and we were safely tucked up for the blow in Christchurch. 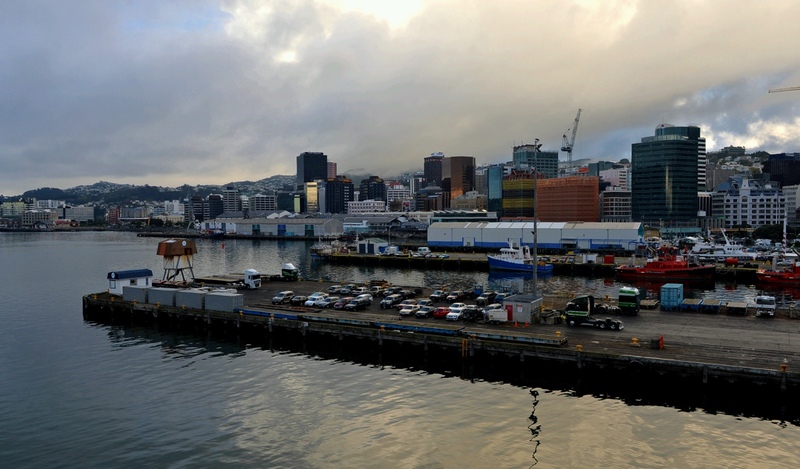 With an early start on Tuesday morning from Evans Bay, we followed Chris and Gary around a very still Wellington waterfront to the Bluebridge ferry terminal. The hour wait in the queue that we expected didn’t eventuate so we were on Bluebridges newest ferry Strait Feronia and in comfy chairs looking out at Wellington city in no time at all. The trip across was magic, little or no wind and pretty flat given it was Cook Strait. 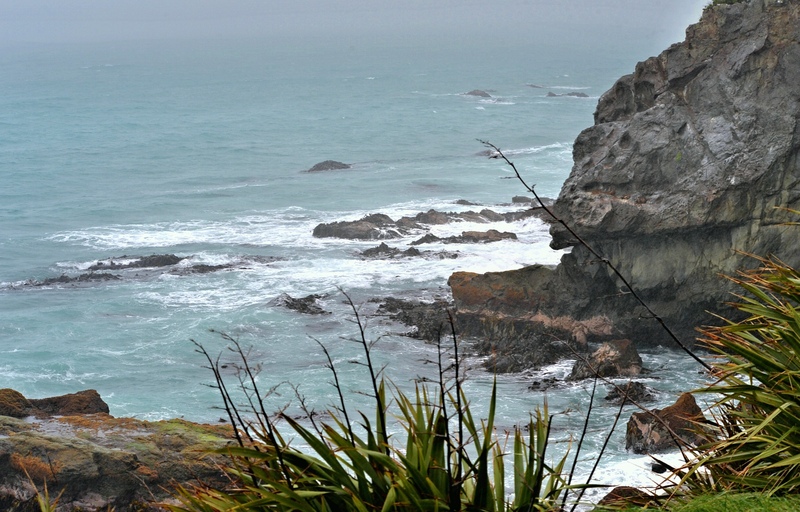 Cook Strait is the water between the North and the South Island of NZ for those offshore. 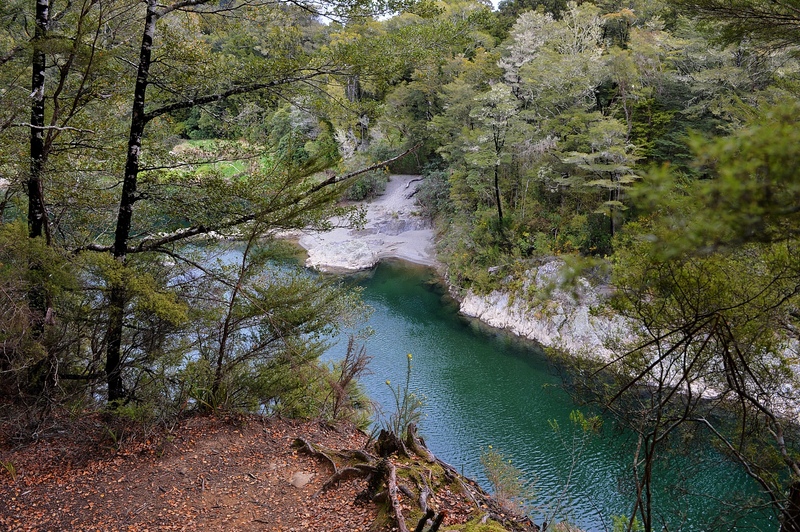 After arriving in Picton, we’d decided to find somewhere for lunch around Blenheim and then head to Pelorus Bridge for the night.. About 60 odd k’s. Driving through the world famous Marlborough vineyards, we came across the Cloudy Bay and Allan Scott vineyards right over the road from each other. 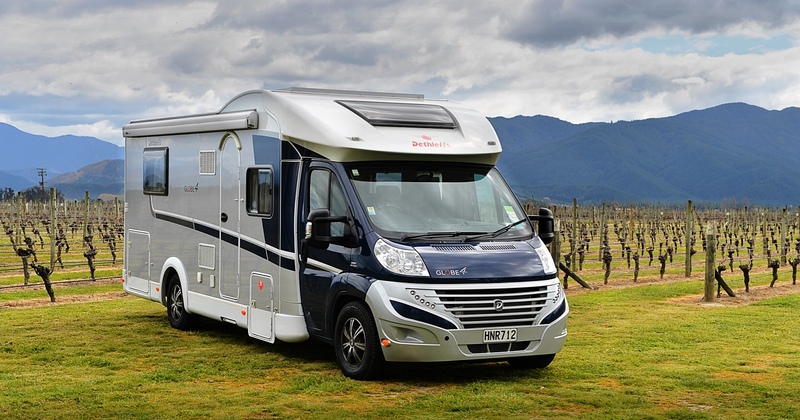 Allan Scotts looked easier for parking two 7m plus motor homes and we found an open gate leading right next to the vines so rather than upset their car park with two motor homes we parked there. After lunch in our van amongst the vines, we went in to gain some wine knowledge and a quick tasting. 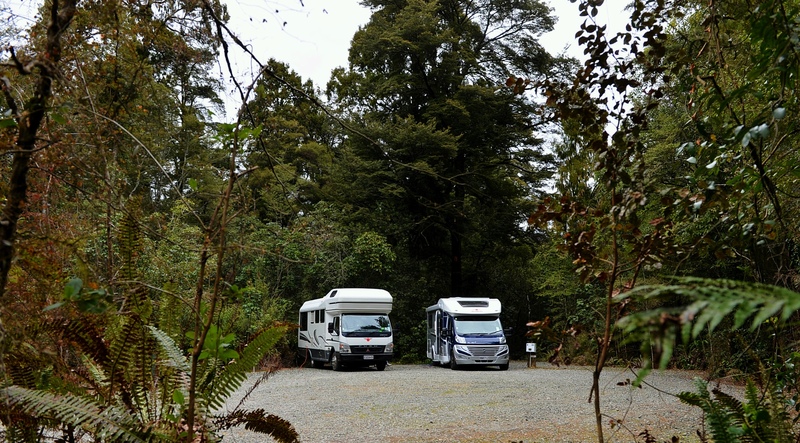 Half an hour or thereabouts easy driving got us to Pelorus Bridge DOC camp. With both Gary and I having annual DOC passes, we found this camp didn’t accept them but it was only $12 each for the night in a nicely manicured bush area with power, toilets and an amazing hot shower! 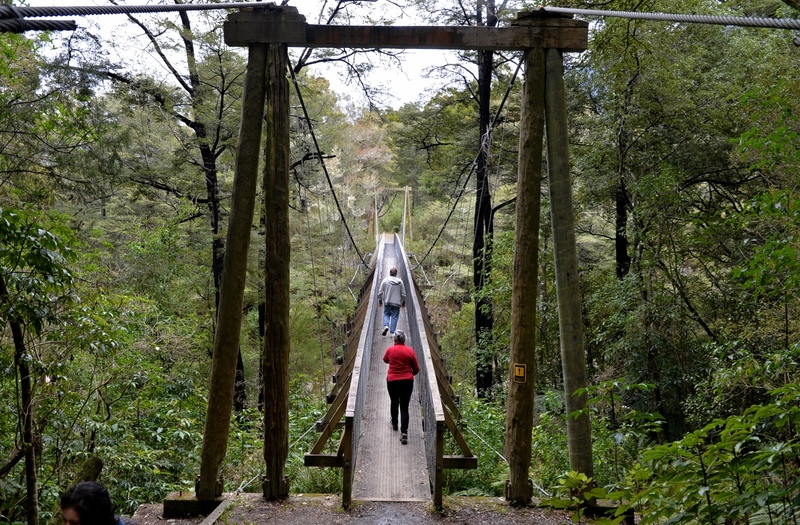 After plugging in and settling down, we set off for a walk along the river to a massive suspension bridge over the Pelorus river. It only took an hour so an easy walk. 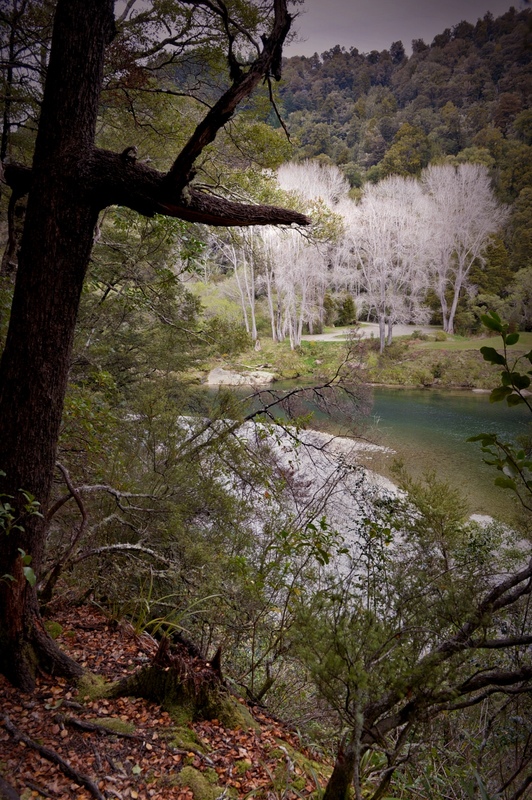 Another view along the Pelorus river edge. Arriving back to the camp, I had to try the shower. What a treat. Plenty of hot water, great pressure in a well setup hut with no tops to the walls so you’re in the bush. Great experience. We finished a great day with a glass of something cold in Rafe. We’re off to Nelson tomorrow. 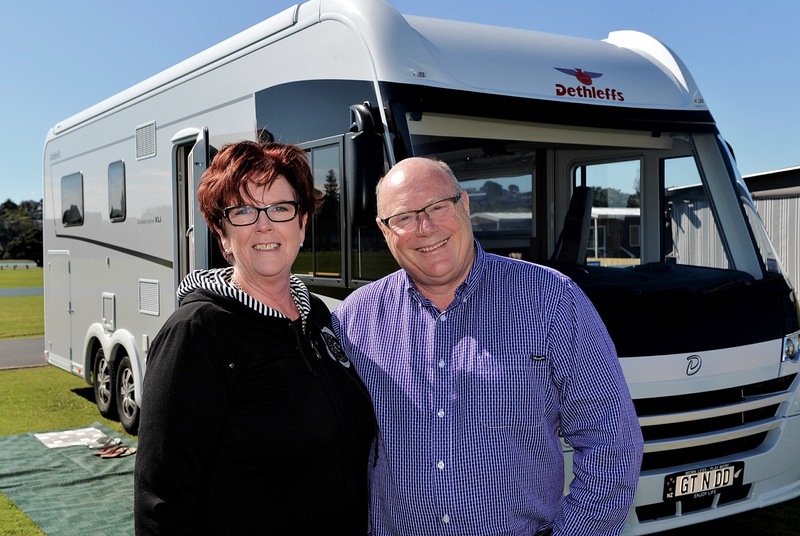 This is their second Mitzi truck, Luton based Motorhome and they’re really pleased with it. 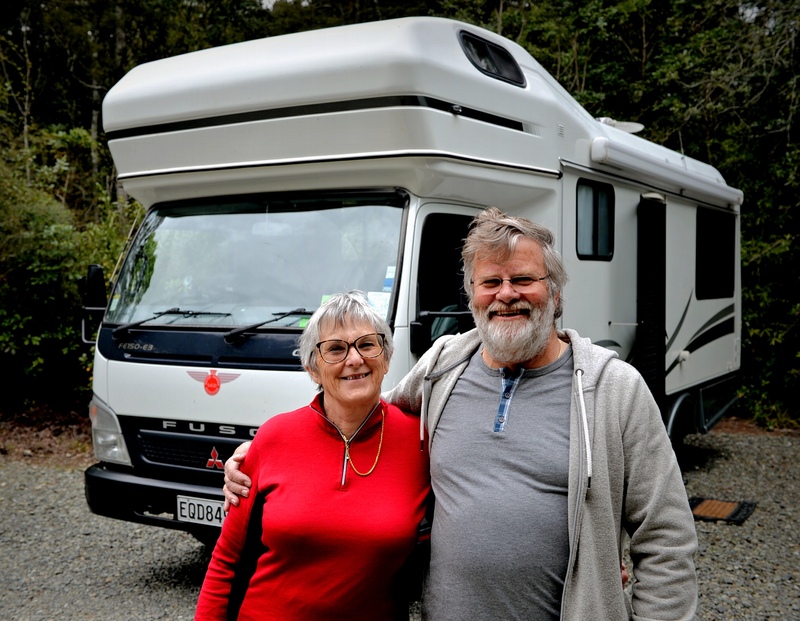 They hit the road full time earlier this year and after driving from their rented out home in Ranfurly to Auckland, they spotted this new van on Trade me. As Gary says, it was the van he’s been looking for forever! 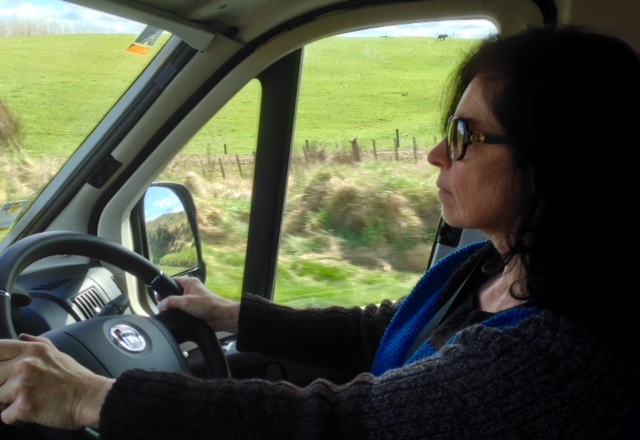 So after many will we, won’t we, moments, they bought the van and flew to Christchurch and drove it back up to Auckland. In the last few months they’ve been back to Ranfurly, worked their way up to the North Island to meet us in Marton last week. 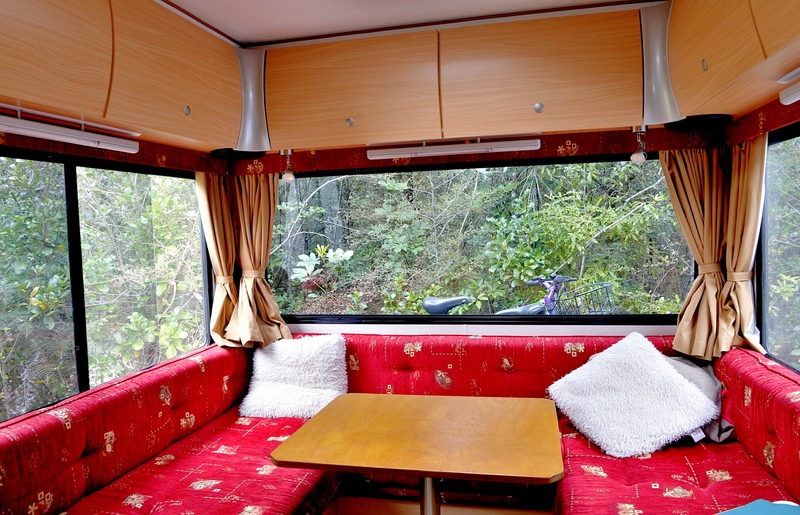 It is 7 m long, has a nice U shaped lounge at the back and heaps of cupboards. 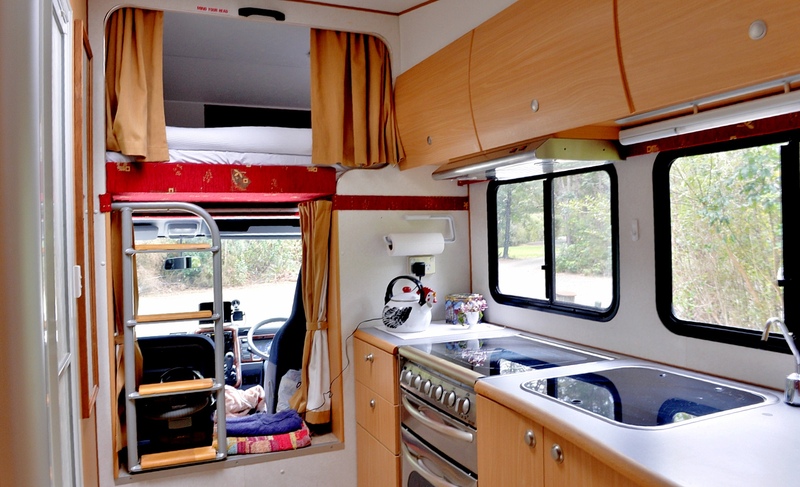 A very comfortable, reliable machine with all the comforts of home. 20th sec exposure at 10000 asa! On Sunday morning a chap from Wellington City popped around in the Evans Bay Marina car park, with his clipboard. He was checking the CSC stickers for parking compliance. For those offshore, this is the self containment with black and grey water. Gary had a natter to him and he mentioned that the parking area was being reviewed. They’re thinking of moving it “up the “coast” which to me sounds like ‘out of town’. 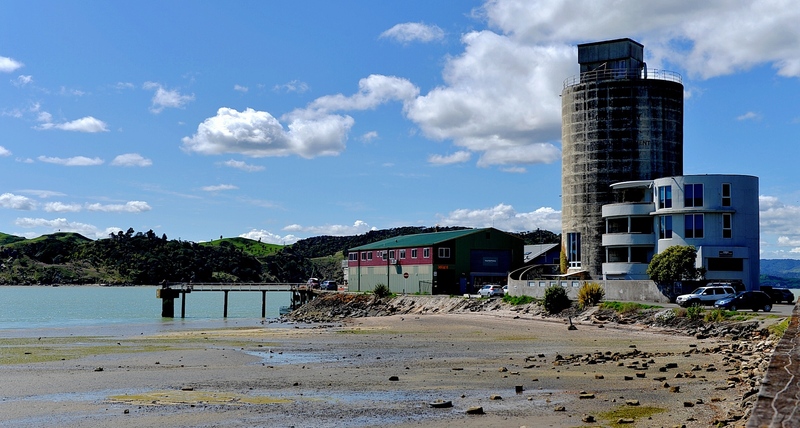 One if the nice things about Evans Bay is its location and closeness to Wellington City. There is also a dump station, toilets and water and a fantastic view. I have to say though, Wellington definitely have more than their share of boy racers and people with sirens. All in all though, it’s a great spot and it would be a real shame to lose it. Does anyone know what’s happening ? 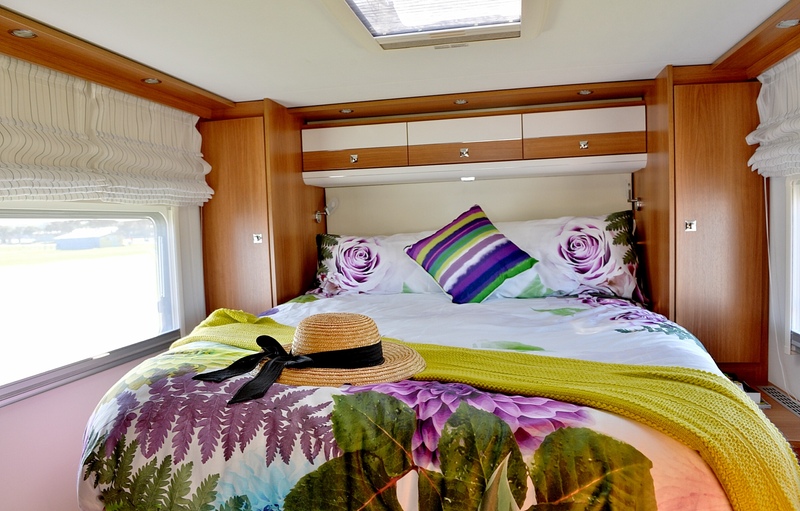 Now into their third Motorhome, they’ve really gone for the best and I think it’s safe to say, they’re pretty chuffed with it too. 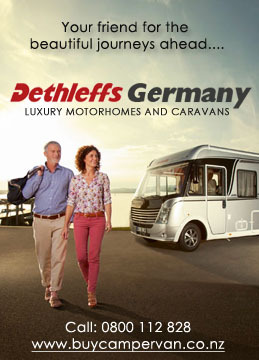 Their new Dethleffs XLI is just the business. At 8.7 metres and 5 tons, there is plenty of room and a payload for Africa. The Garage across the back is enormous and the brochures show a scooter standing upright in it, I think you would probably fit two in! 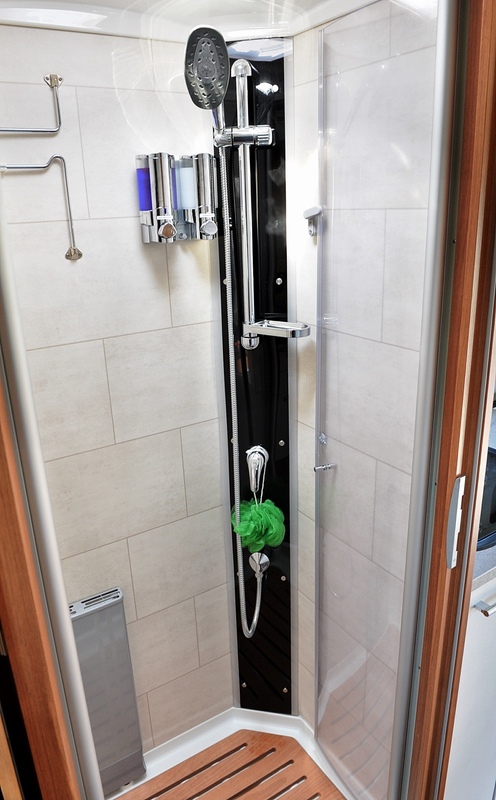 The shower and toilet area is divided from both the main bedroom and dining area by two sets of doors, effectively setting it upas an ensuite and it’s very nicely done. 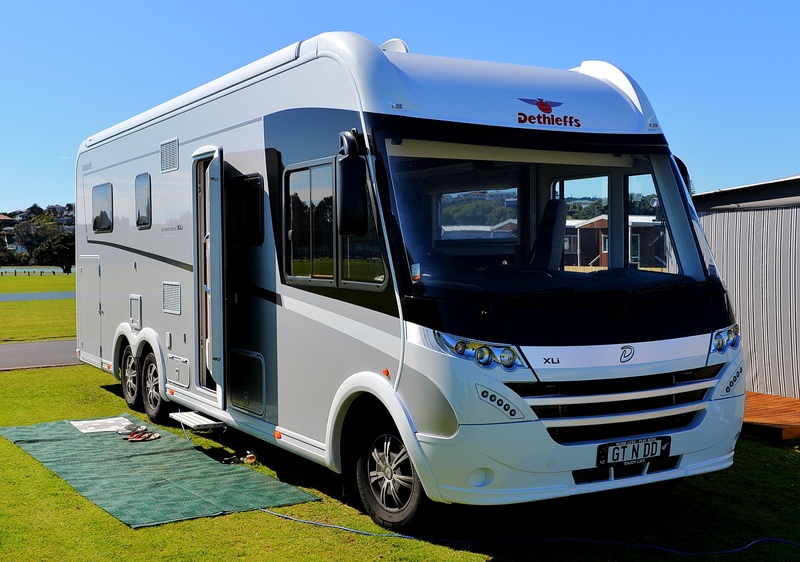 A really nice machine , and I’m pleased that they’re back on the road enjoying their Motorhome. Before we left Raglan, we had to check out the famous Raglan beach, then onto Hamilton to get diesel and the to check out a neat wee cafe that Dianne and Gary knew just out of Cambridge called the Red Cherry. We decided on an early lunch and then after more goodbyes, set off for Marton. 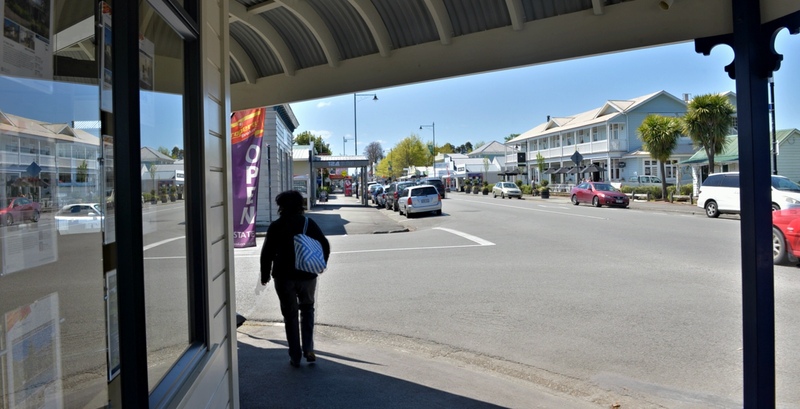 Gary mentioned going down the western side of Lake Taupo, turning off at Tokoroa. Great idea as there was no traffic to queue behind so Madam decided to have a drive. Now that Rafe is run in and everything has settled down, she found it a doddle. 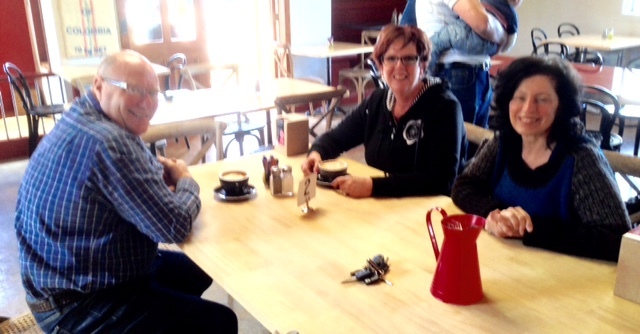 After stopping briefly at Turangi for a cuppa, went went all the way through to Marton. We arrived about 5pm just before dusk and it was nice to see Gary and Chris again. 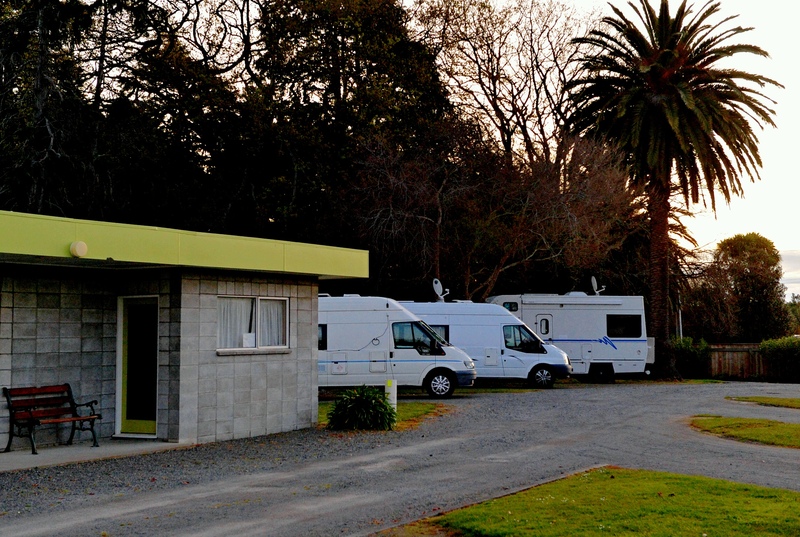 The NZMCA park at Marton is a fantastic facility set up with toilets, showers, water and a library. I think I also saw a kitchen there too. To those set this up, well done, a great place to stay. The next morning, we were off again to Wellington, stopping briefly for diesel at Levin and cuppa shortly after. Arriving at Evans Bay Marina around 1pm, we had plenty of time to get ready for the show at 5pm. Evans Bay Marina is near the airport and is a well know free camping spot with Potable water, a dump station, toilets and a great view. 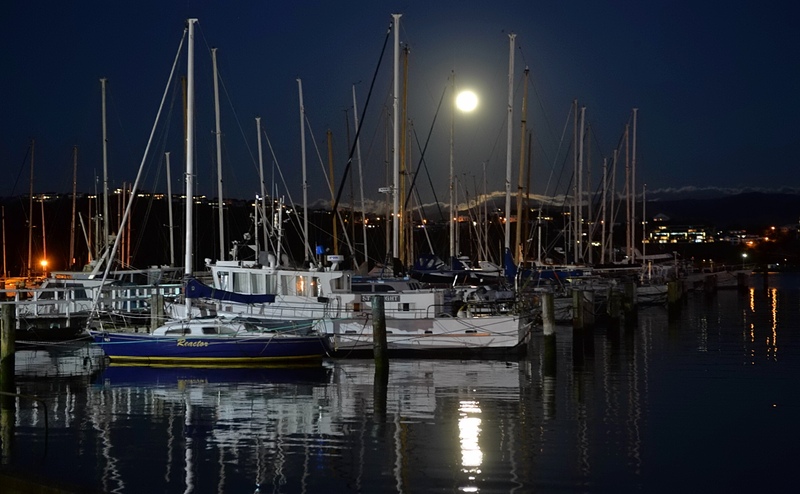 Evans Bay Marina. It’s great watching the planes land. Evans Bay is about 15 minutes drive from town, it is $7.50 each in a bus, so we got a cab at $25. Also much more convenient. The show was fantastic, clever people doing clever things. Every Kiwi should see it. This was our third time going and I’d do it again. 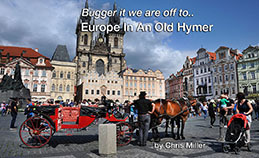 My apologies for the strange postings, I’ve been trying out an offline blog program and its been a failure!